How Can You Tell that Your Senior's Vision Might Be Failing? ← Should Your Parent Come to Your Home During a Weather Emergency? 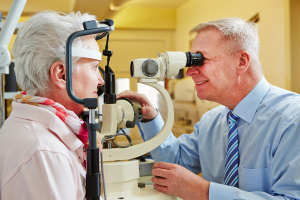 How Can You Tell that Your Senior’s Vision Might Be Failing? Elder Care Oakland TN – How Can You Tell that Your Senior’s Vision Might Be Failing? Your senior’s vision may change many times over the course of her life, but are there ways for you to notice when she may be having trouble seeing well? Some of these clues are subtle, but they can help you to notice changes. If your elderly family member can’t see well, she may be more likely to shuffle her feet or to walk in a way that shows she’s nervous about her footing. She may also be reaching out to grab the wall or furniture to help guide herself. Pay attention to how she knows where she is. People rely more on their vision to eat and to drink than they realize they do. If your senior is suddenly having a tough time using her fork or spilling food on the way to her mouth, that could be a sign that her vision is giving her problems. She may also start missing her mouth when she tries to drink. Some of the activities that your senior enjoys, such as reading or anything else that requires her to see well, might be activities she’s stopped doing recently. Some of these activities might not be obvious, but if she’s stopped driving, that can be a big indication that there’s more going on. When your senior reaches for objects, pay attention to whether she misses them. Reaching just past something or seeming to expect the object to be in a different spot are big indications that her eyes and her brain may not be communicating with each other. Depending on how bad your senior’s vision is getting, she may be dressing differently, too. She may have a difficult time matching colors or she might be putting clothing items together that she never put together before. You might notice also that little accessories, such as socks, don’t match and they used to. When your loved one can’t see well, her handwriting may look different to you. This can happen because she may not be able to see her own handwriting as well and she may make some mistakes. Misspelled words could also be another clue. If you’re concerned that your senior’s vision may be failing, schedule an eye exam right away. Her eye doctor can help to determine what might be going on. Remember that if you’re not able to be there with your senior, elder care providers can help you to spot some of these situations, too. For Elder Care Services in Oakland TN, please contact the caring staff at Personal Care Services MidSouth today! This entry was posted in Elder Care Oakland TN, Personal Care Tips and tagged Elder Care Oakland TN. Bookmark the permalink.